good gravy, Gearbox saves the best for last! There's so much I want to tell you about the fourth installment in the Borderlands 2 downloadable content library! I'm going to do something I don't normally do and have a "spoilers" section so those of you who want to can read about some of the game and those that don't want to hear a peep before they play can avoid it. If you couldn't tell from that caveat, I absolutely loved this add-on. The Mr. Torque DLC was fantastic, but I have to say that this one is even slightly better. The story is a game inside a game. You are playing Bunkers & Badasses, a clear tribute to Dungeons & Dragons. However, instead of playing as wizards and warriors, you are playing as vault hunters. Tiny Tina is the Bunker Master (Dungeon master) and, therefore, in charge of the action. Having a psychopathic 13-year-old running things can lead to some awfully interesting situations. The writing for this DLC is the best of the set. Not only does it hold up in the wit department against the rest of the game, it has more references than an episode of Family Guy. Besides D&D, it also pays homage to Indiana Jones, Back to the Future, Fantasia, Lord of the Rings, and Game of Thrones among others. I probably missed a few in there, too. You begin the game at the Unassuming Docks of Potentially Little Importance. You are immediately killed by an unbeatable dragon, at which point Lilith has to explain some of the rules to Tina like, you can't start the game with an un-killable boss. After Tina relents and brings on "Mister Boney Pants Guy" instead, you make your way to Flamerock Refuge. The town has lost its queen. An evil, yet Handsome sorcerer cast a spell that brought eternal darkness to Flamerock Ridge. The queen went on a quest to try to get rid of the spell and bring back the sun, but she hasn't returned to town. That's where you come in! While there are many side quests, the main story revolves around your search for the queen. That's all I'll say for the moment as I don't want to give too much of this glorious game away. They manage to tie in some emotional content along with the violence. Tina pretends not to know that Roland and Bloodwing were killed in the main questline. For a game that is rarely sentimental, they pull it off quite well. They work in references to the dead characters, which are followed quickly by Tina's willful ignorance to their passing. Borderlands manages to work in sympathy and feeling with the skill of early Saturday Night Live star movies like Trading Places and Animal House while remaining true to its action-packed, wit-filled roots. Nearly everything but the guns in the game has a melange of Tolkein, Game of Thrones, and D&D, down to the vending machines. Marcus Munitions has become Marcus Missiles and it warns you to, "Watch out for those orcs!" Zed's Apothecary quips, "Have fun storming the tower." There's another reference to a movie I just watched, The Princess Bride. It felt a bit like walking around in Skyrim with corrosive sub-machine guns and missile launchers while listening to music reminiscent of Fable. The parts that take place in a dwarven mine and temple recall the soundtrack from Snow White and Raiders of the Lost Ark, respectively..
Luckily for all of us, Mr. Torque returns to reprise his role as the comical juice box that made his own DLC so entertaining. He calls Tina on her cell phone and begs to be a part of the action. His nerd cred is duly tested and she reluctantly gives in, but places restrictions on the Macho Man so that control of the game remains squarely in her little borderline personality disorder brain. There are several other new additions to go along with the return of Mr. Torque. 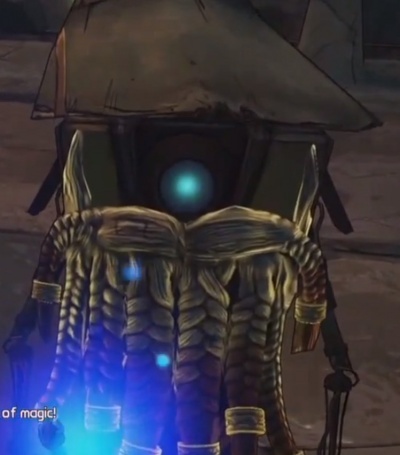 New to the Borderlands are enemies that include skeletons, spiders, dwarves, orcs, and dragons. The only thing that is missing is a hobbit or two. I can't help it. Usually I have enough restraint, but this time I just have to share some of the amazing dialogue that this DLC has to offer. Most of these are just hilarious quotes that reference existing sci fi classics. Go ahead and skip to the next section if you don't want to read some funny stuff because they're spoilers. This section finishes when the text returns to black. The town of Flamerock Refuge smells, according to Tina, like "Butts and death." When testing Mr. Torque's nerd cred, Lilith states, "(I've) gotta make sure you're not just faking geek-hood because it's trendy." You're darn right it is, fellow nerf herders! In a reference to Back to the Future, the Hyperion reincarnation machine slightly adjusts the classic line for its own purposes saying, "Lives? Where we're going we don't need...lives." At one point, characters repeat the line, "Oh dum shivi. Oh dum shivi. Oh dum shivi," which is only slightly altered from its original appearance in the Temple of Doom. Claptrap the Wizard tries to halt your progress across a bridge shouting, "You shall not pass!" Guess what? You get by. At another point, Claptrap attempts to use his powers but he ends up in the same situation as Mickey in The Sorcerer's Apprentice. There is a dwarven rune password you must put in the right order. Tina has made the password F-A-R-T. Heh, fart. Mordecai isn't a huge fan of the game, saying, "I hate dice." I tend to agree. Mordecai says, "This is like that...show that...show. I haven't watched it. Lilith responds, "Well if you had, you'd think this was awesome!" It was. A Necromancer from Evil Dead repeats the REAL magic words, "Clatto, Verata, Nicto," before being killed. \That's all I have in the way of spoilers. I didn't want to share anything that would ruin the game, but I like to err on the side of caution when dealing with games and their fans. While some of these quotes might dampen your enjoyment of the game when you hear them live, none of them will reveal vital parts of the story line. I can spoil a little bit, but not the entire game. I have too many gamer morals for that. No, it wasn't perfect, but it was darn close. One of the VERY minor annoyances was that the smaller loot boxes didn't always contain cash like they did in the rest of the game. When playing with a character who has maxed out his or her ammo, there's really no reason to open the normal loot boxes, but I always opened the smaller ones because I can't say no to cash, even small amounts. This was more than made up for by the chests like the one seen above. 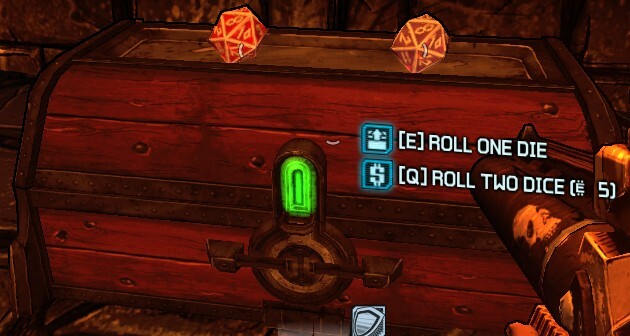 You are able to spend one eridium and roll one die. For five eridium, you can roll both. If you manage to hit a 20 or higher, you're almost guaranteed some serious loot, purple guns or better. Another mildly annoying portion of the DLC is the leveling system. In playing with my level 37 Commando on regular mode, all of the missions were level 35, nevermind that I had leveld up to 40 by the time the DLC was complete. When I finished that playthrough and turned to my level 51 Assassin in True Vault Hunter Mode, all of the missions were level 50. In the first go around in regular mode, the missions started out as a "good match," but eventually became "trivial" as I leveled up. I suspect the leveling will take too long in True Vault Hunter Mode to make any of the missions trivial, but it's still a bit off-putting that they wouldn't just level the game to your existing character. I didn't try with a lower level character, but it's on my to-do list. The fourth (and possibly final) installment in the Borderlands 2 downloadable content library is the best. It isn't far and away from the next best DLC, but it's clearly tops. It isn't just witty, but the smartest of the BL2 DLC. The writing is worthy of awards. It is the first to add considerable amounts of emotional content. 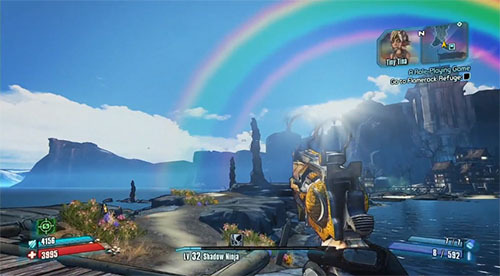 It takes place almost entirely in an alternate universe, but unlike Fallout 3's Operation: Anchorage, it uses the alternate setting to its fullest potential. If you are only going to play one Borderlands 2 downloadable add-on this year, make it Tiny Tina! If you play two, get Torque. Penalties: -1 for a few minor complaints. The lack of setting the level near the player should be easy to do, but they aren't. Unless you're near the pre-determined level, the game is either too easy or too hard. Bonuses: +1 for the most creative, hilarious, deep, and emotional writing of any of the Borderlands 2 downloadable content. Nerd Coefficient: 9/10. Very high quality. Standout in its category.